Brielle Smith of Oakcrest won the girls javelin on her final throw,, the River Dell girls and the Delsea boys won the Emerging Elite 4x800-meter relay titles, and Devin Hart and Alexa Westley each placed third in the 5K on the opening day of the New Balance National Championships on Friday at Aggie Stadium on the campus of North Carolina A&T in Greensboro, N.C.
Smith, a junior who set the NJ state record with a 163-8 at the NJ Meet of Champions last Saturday, was in second place until launching a 150-5 on her final attempt to overtake Shira Stoller of Massachusetts, who led with a 148-10, to win the girls javelin title. River Dell's all-underclassmen squad, led by Amanda Mircovich's 2:15.55 leadoff leg, cranked out a NJ #3 and meet record 9:15.54, No. 7 in Bergen County history, to capture the girls EE 4x800. Delsea, the Meet of Champions winner in a NJ#1 7:46. made it a NJ sweep by winning the boys EE 4x800 in 7:51.57 to put the finishing touches on an undefeated season. Delsea's Michael Szwed dropped a 1:52.73 anchor to overtake Mendham and secure the win. Mendham was second in 7:53.16. 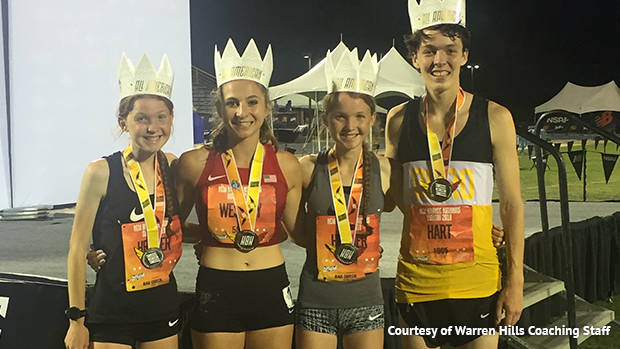 Hart and Westley, the NJ Meet of Champions winners in the 3,200, came up with huge performances in the 5K to earn All-American honors. Hart, a junior at Point Pleasant Boro, was third in the boys race in 14:44.06, No. 9 in state history. Westley, a junior at Warren Hills was third in the girls race in 17:03.95, No. 6 in state history. The Hebner twins from Northern Highlands also earned All-American honors in the 5K. 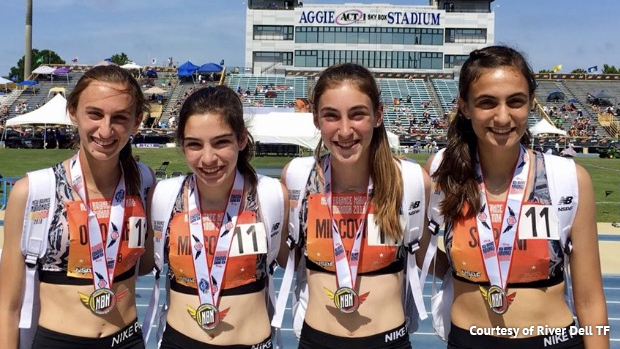 Monica, the NJ M of C XC winner this past fall, was fourth in 17:05.30, and Isabel took sixth in 17:09.82. New Jersey swept the first four places in the girls EE 400 with Athing Mu of the Trenton Track Club crossing first in 54.12. Aliyah Taylor of Rancocas Valley was second in 55.13, Khamil Evans of Union Catholic was third in 55.33, and Victoria Vanriele of Governor Livingston placed fourth in 55.46. Lauren Princz of Egg Harbor, the NJ Meet of Champions winner in the 200, won the girls Freshman 100 dash in a school record 11.81. Paul VI won the boys 4x200 in 1:28.38 and placed seventh in the girls 4x200 in 1:44.22, and fifth in the girls Swedish Relay in 2:15.18. East Orange was third in the boys Swedish Relay in 1:55.02. NJ also went 1-3 in the boys EE 110 hurdles as Ola Akande of Rahway finished first in 14.07 and Ryan McLaughlin of Union Catholic finished third in 14.12. Shannon Ziccarello of Whippany Park won the girls EE javelin with a throw of 125-9. Tyler Hrbek of Old Tappan, the M of C winner, was third in the boys EE pole vault by clearing 15-3 1/2, and David Bausmith of Hunterdon Central also made 15-3 1/2 to finish fourth. The Summit boys placed second in the EE SMR in 3:31.54, and fourth in the EE 800 SMR in 1:34.30. Both times are school records. The Pope John boys ran 1:34.15 to place second in the EE 800 SMR, and the Pope Jhohn girls finished sixth in the EE 4x800 in 9:26.86. PJ received a red hot split of 2:12.39 from anchor Emma Myer. Justice Sims of Seton Hall Prep placed third in the boys EE TJ with a 47-1. In the boys EE 400, Brandon Laraque of Woodbridge was third in 48.48 and Andrew Canale of CBA was fourth in 48.51. Lawrence placed fifth in the girls 800 SMR in a school record 1:48.31. Mijah Collier split 57.11 on the anchor.